Italians embrace the holiday season with many seasonal market, events and festivals. There are many religious holidays between December and January. The festivities generally begin on December 6th with “La Festa di San Nicola” to honor St. Nicholas, the patron Saint of the Sheperds and end on January 6 with “La Festa dell’ Epifania” ( The Epiphany). 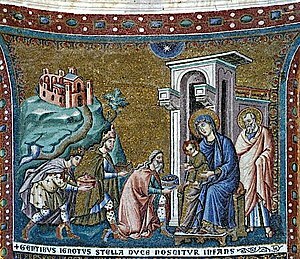 After Emperor Constantine adopted Christianity, instead of ending the holiday at the New Year, it was extended to the Epiphany. The Epiphany is the 12th day of Christmas when the three Wise Men gave gifts to Baby Jesus. December 8th is the Feast Day of the Immaculate Conception, a national holiday. Rome celebrates with floral wreaths and a ceremony at the Spanish Steps by the Pope. The primary symbol of the Christmas season is the “presepio”, the nativity scene. They depict the birth of Christ. 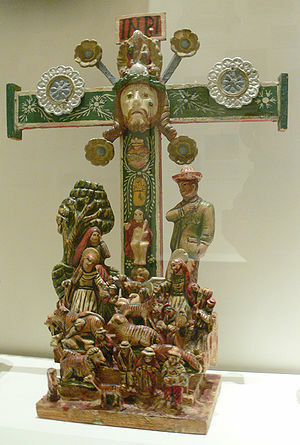 It is believed that in the 13th century, St. Francis, a modest monk, created the first replica of the scene by portraying the child born in Bethlehem. He placed an ox and a donkey next to a manger near the hermitage he built in Greccio, near the town of Assisi. By the 18th century, the patronage of King Charles elevated the status of “Il Precepio” to stratosperic levels. During the reign of Ferdinand IV of Bourbon, famous artists like Giuesspe Sanmartino were even commissioned to create the figures. Most of the prized figures made of terra cotta and wood are produced in the workshops of Naples on Via Gregorio Armeno. Today, elaborate scenes are set up in churches throughout Italy. In some towns, living nativity scenes are usually staged when costumed participants wander through the streets.The first Christmas mass was conducted at the Church of Santa Maria Maggiore and the earliest known permanent Nativity Scene was created for the Rome Jubilee of 1300. Vatican City erects a huge presepe in St. Peter’s Square for Christmas and is usually unveiled on Christmas Eve. 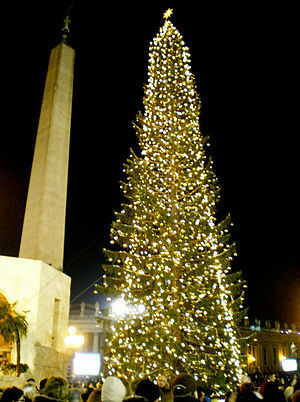 A Christmas Eve mass is held in St. Peter’s square, usually at 10 pm. In Rome, some of the biggest and most elaborate presepi are erected in Piazza del Poplo with 100 presepi on display from November 26th to January 6th www.presepi.it. Piazza Euclide, Santa Maria in Trastevere and Santa Maria D’Aracoeli on Capitoline Hill also host elaborate displays. A life-sized nativity scene is set up in Piazza Navona with a large Christmas Market from November 26th to January 6th with a Mercato della Bufana. The Church of Saints Cosma e Damiano has a large nativity scene from Naples on display all year long. It is located by the main entrance of the Roman Forum. Il Museo Tipologico is under the Church of Saints Quirico e Giulitta and has over 3000 figurines from all over the world. It is open each afternoon between December 24th to January 6th. Gifts are exchanged on the day of the Epiphany. Children hang up their stockings on the evening of January 5th awaiting a visit from “La Befana” a legendary old woman who flys around on a broom bearing gifts. According to legend, the Three Wise Men asked La Befana for directions to Bethlehem but she declined. It took an unusually bright light and a band of angels to convince La Befana that she must join the Wise Men, but she was too late. She never found the Christ child and has been looking for him ever since. So on the January 5th, she goes out on her broom delivering treats to the sleeping children of Italy. The Santa figure in Italy is called “Babbo Natale”, Father Christmas. Charlemagne’s coronation took place in Rome on Christmas day in 800 AD. A trip to the Vatican City for Christmas is very exciting. The Vatican City erects a huge presepi in St. Peter’s Square and it is usually unveiled on Christmas Eve. On Christmas Eve, the Pope celebrates midnight mass at St. Peter’s Basilica. On Christmas day in St. Peter’s Square at noon the Pope gives his blessing from the window of his apartment overlooking the Square to the crowds gathered at the Vatican. On December 8th, the Feast Day of the Immaculate Conception, the Pope leads a procession to honor the Virgin Mary near the Spanish Steps. Stay in Rome for the New Year Parade on January 1st and the Epiphany tradition when hundreds of people in medieval costumes walk along the wide avenue leading up to the Vatican, carrying symbollic gifts for the Pope. The Pope says a morning mass in St. Peter’s Basilica to commemorate the visit of the Wise Men bearing gifts for Jesus. In Rome, the traditional dish of Christmas Eve is “Capitone”, a big female eel that is roasted, baked or fried. Common Italian Christmas sweets are Panettone (a cake filled with candied fruit), torrone (nougat), and panforte (gingerbread). 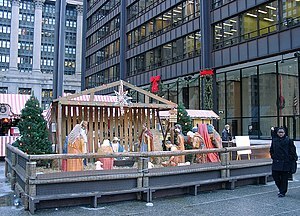 Christmas in Italy includes Nativity Scenes and other Christmas Celebrations.